Getting a Portsmouth badge for your improving scores has not, it has to be admitted, been a big ceremonial affair. To an extent, we have to confess, that this has perhaps demeaned the significance of the badges. You present your evidence of score and we huddle in a corner to sort out your higher award. A fairly low key affair. It was never intended that a huge fuss would be made over the badges, as they are, after all, PERSONAL awards for achievement. However, over this Winter season, several archers have taken advantage of the scheme, and are justifiably proud of what they are achieving. 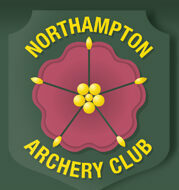 For some archers the badges have been a great incentive and indicator of their progress in archery. We congratulate all those who have progressed so well using the scheme, and as the indoor season nears a close, hope that you will take advantage of the 252 awards. If you wish to know more about these awards please visit our Awards Pages on this web-site. ← First NAC Open Portsmouth Competition!